Published: . Filed Under: Blogging, Culture. As I’ve grown older, music has become less and less important to my daily life. When I was a kid and then a teenager, music was always on. My dad was a huge music fan and introduced me to stuff (as I kicked and screamed because all I really wanted to hear was Michael Jackson and Foreigner and Duran Duran) like Bob Marley, Van Morrison, the Beatles, Tom Waits, and Bob Dylan. I’m forever grateful for that early music education. As a teenager, I bought a lot of records, tapes, and then (finally) CDs. And when iPods came out, I loved making my own playlists. My musical tastes evolved from 1980s pop (yes, even New Kids on the Block) to 1990s darkness (Smiths, The Cure) to pop again to indie mainstream (Wilco, Feist, Death Cab For Cuties). Somewhere between graduate school and being a new parent, the music has died in my house, in my head, and in my heart. Yet during the last weeks I’ve been reading (and reading and reading) stories of friendship loss, submissions for our next anthology about friendship breakups and loss called “My Other Ex: Women on Losing and Leaving Friendship.” Many of the stories are sad, others are incredibly dark and tragic, others are bittersweet, and lots are laced with nostalgia. I’ve also been writing my own story of a friendship breakup, one which is deeply entangled in my memories of the worst romantic breakup of my life. Part of what my co-editor Stephanie and I have learned quickly about friendship breakups is that women describe them as just as painful and confusing and sad as a romantic breakup. So maybe that’s why I have all these breakup songs in my head. Because these stories of loss are just as mournful as any I could write about any romantic breakup. You see, back in my twenties and early thirties, I was a serious breakup mix maker. When I was going through breakups — serious ones, painful ones, stupid ones, silly ones, bewildering ones — I developed a ritual to get over every relationship. When I was going through the first hours and days after a relationship ended, I wanted music, only music. Normally there is nothing more soothing and able to bring me pleasure as books or a great television show. But then I wanted poetry set to music. I wanted raw words and emotion. Just for a while. No fillers, just the cut to the bone words of great songwriting. Here were my standards, my go-to songs for getting through heartbreak, and they are the songs that find myself wanting to listen to as I read these women’s stories. “Everything Reminds Me of Her” by Elliot Smith. Elliot died young, and I can’t listen to his music without thinking about his battles with drug addiction and depression. He was a dark soul but a gifted one. “Nothing Compares 2 U” by Sinead O’Connor. This was the first breakup song that I couldn’t stop listening to. The pain and emotion in her voice can still take your breath away, even decades later. “I Am Trying to Break Your Heart” from Wilco. This song takes a while to get going, but (as usual) it’s brilliantly written and strangely addictive. “Pictures of You” by The Cure. Every breakup, every time, this song was on repeat. “Most of the Time” by Bob Dylan. In normal times, I’m not a huge Bob Dylan fan. I appreciate his talent and his lyrics, but his voice gets in the way for me. However, during times of breakup, I reached for the Dylan albums. I had a hard time picking between “Most of the Time” and “Don’t Think Twice,” but I think this one wins out because it’s in one of my all-time favorite movies, “High Fidelity” (as well as my favorite Nick Hornby novel, one that I’ve read about 100 times). And that repeated line, “most of the time?” Gets me every time. “You Oughta Know” by Alanis Morrisette. So is there any song — any song — that so perfectly conveys the rage, anger, hurt, desperation, and temporary feelings of mental instability that accompanies a breakup? 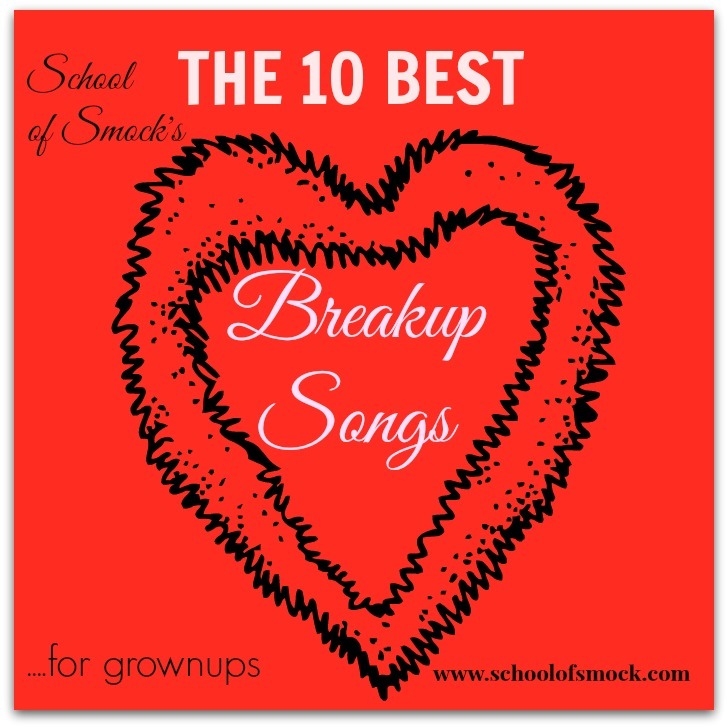 And my favorite breakup song (and the tenth breakup song on this list that I recommend) is “A Case of You” by Joni Mitchell. Just listen to it, again and again. All of these songs are about loss, and they could be about the pain from losing a relationship of any sort — friend, lover, spouse. Do you have a favorite breakup song that got you through a tough breakup, either with a friend or partner? If you have gone through a friendship breakup, we’d appreciate it if you’d take our friendship breakup survey. Stay tuned at The HerStories Project to learn more about our next book! I like Avenged Sevenfold Afterlife. Jessica Cobb @Domestic Pirate recently posted…I am my own worst critic. There are plenty of good songs just ruined because I listened to them during a break up. I have to say that I am so thankful that Adele’s album 21 didn’t melt when I played it for months straight and also wasn’t ruined by being associated with a break up. Whew. Yes! If I had been going through a breakup (I was married already when it came out), I don’t think I would have ever stopped listening to “Someone Like You” for months. Sinead and The Cure. Yes indeed! Oh… Nothing Compares 2 U… how that brings back memories of high school break ups. Ha! Pictures of You – absolutely! Thanks, Jennifer. I don’t know that Karen Carpenter song! Sinead and The Cure always take me back to 16. You Oughta Know was the first angry song I really identified with- Alanis rocks! She certainly does! I’m convinced we might have been switched at birth. We were born exactly two months apart. When hubby and I were in a rough patch before we were engaged, I listened to ‘Right Here’ by Staind, and an insane amount of Hoobastank. Hearing them now still brings back a pang of sadness, remembering what we went through. Jessica, this is such a great list. I especially love Wilco and The Cure. I feel like I’m in high school, sitting on the floor in front of my huge stereo, trying to figure out the perfect order for my next mixed tape. Ah memories. Also, I’m so sorry that I didn’t contribute anything to the next Her Stories book. I kept writing it in my head but it just never really came to fruition. I’ve no doubt that the next book will be amazing. Kristi, I totally get it. Would you believe that I still haven’t finished my own piece? It’s really hard! As a U2 fan I have to go w/ With or Without You or One. But then again those songs seem more like I want to breakup but I can’t stay away from you songs. So interesting, Jessica! I, like you, have lost touch with my musical past. I wonder if this happens to people as they get older? I don’t know. As for break-up music, there are some songs I just cannot listen to anymore because they remind me of people, break-ups, etc. I don’t have too many standard go-to songs that I listen to. And it’s been a while since I broke up with anyone… more than 10 years! But there are a few that pop into my head … Sheryl Crow – The First Cut is the Deepest. Indigo Girls – Ghost. The break-up song in La Boheme (I know, I’m sorry, that is so dorky but it’s true). This post was interesting to me especially following our offline conversation about your essay. It really is like a breakup. I still can’t confront some of my friend breakups, and there are songs that remind me of those people, too! Pink had a great song out when I was writing my (non defunct) novel about friendship breakups a few years ago. It was “Who Knew.” It was perfect. Nina recently posted…I’m on The Happiness Project Blog! Kristen @ Motherese recently posted…He’s a Poet and He Doesn’t Know It? Alanis Morrisette is always a fav. of mine when I’m sad.